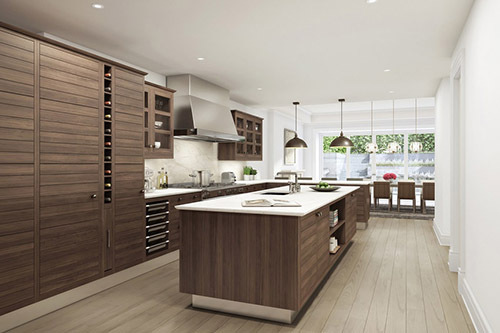 More and more, kitchens are incorporating dining rooms and sitting rooms into a unified open floor plan. Consequently, kitchen cabinets are looking more like fine furniture, and counters and islands are becoming dining tables. Banquette seating can offer comfortable seating for people who congregate in the kitchen for more than food. 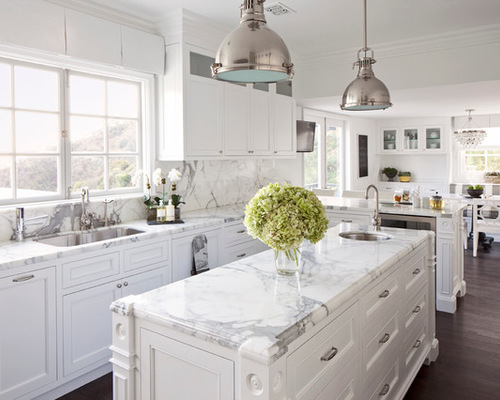 We still love the white cabinetry. 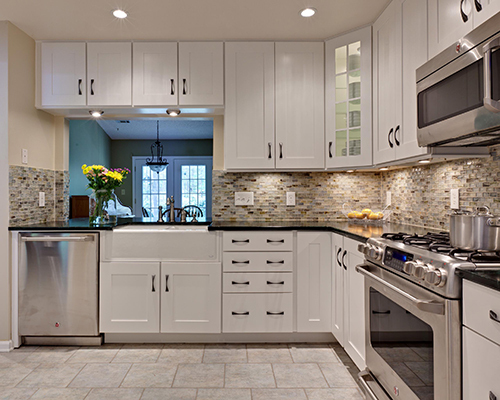 Beautiful and timeless, white cabinets are a versatile choice for any kitchen. 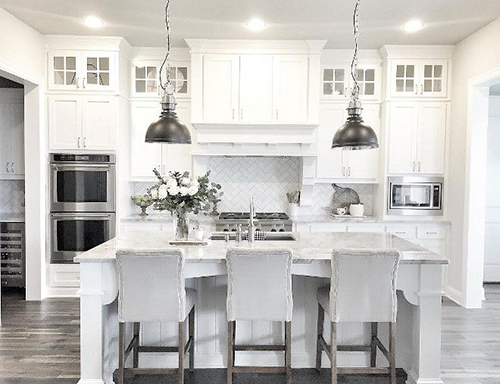 One attraction of white cabinetry is that it works with multiple design styles — including traditional, country chic, and contemporary. 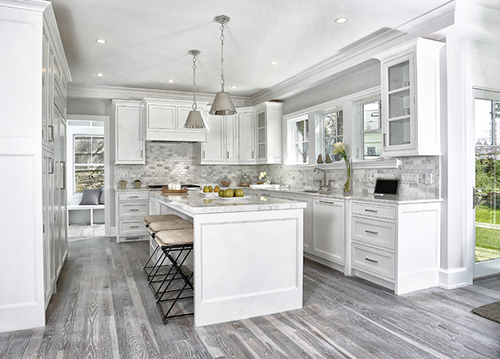 White cabinetry opens a room to a number of decor choices and color palettes that have no boundaries and turns the kitchen into a backdrop that can be embellished as much or as little as you’d like. It’s timeless and comes in a variety of shades such as sky, indigo, and aqua. Plus, like white, blue works in a variety of design styles. 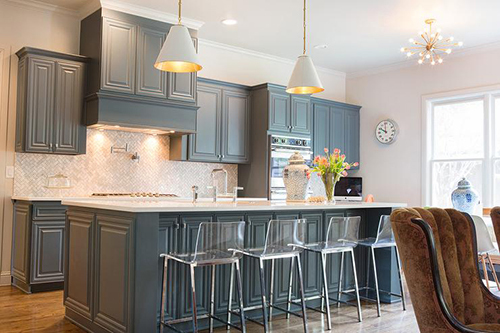 Consider it as a go-to color for backsplashes, islands, or even your perimeter cabinets. Say “Hello” to dark metals in the kitchen. Polished chrome and nickel accents are giving way to black faucets, burnished steel pendants and matte black cabinetry handles. 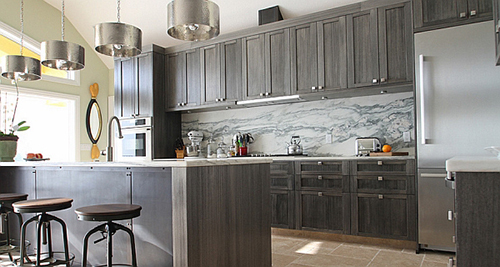 The dark finishes can work in sleek modern kitchens or the most cottagey of cooking spaces. With white kitchens continuing to dominate, a dash of black can provide high contrast and instantly update tired cabinetry. In 2017, we will continue to see cabinetry painted white and various shades of grey. 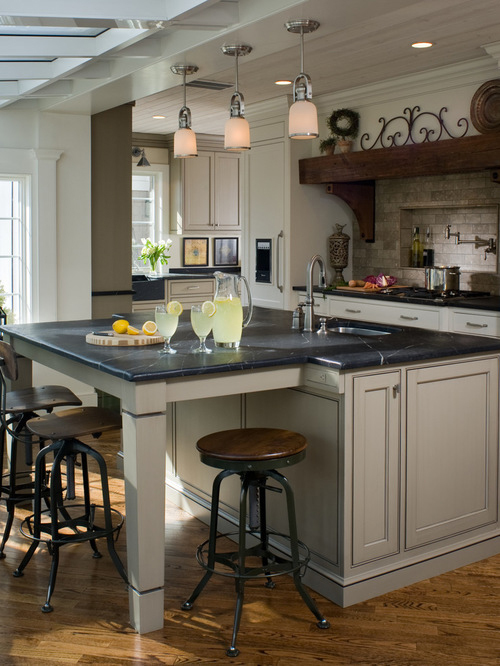 We will also see cabinetry painted warmer tones such as greige (grey & beige), taupe and mushroom. Islands in a different color or stain than the perimeter cabinetry will continue to be prevalent. 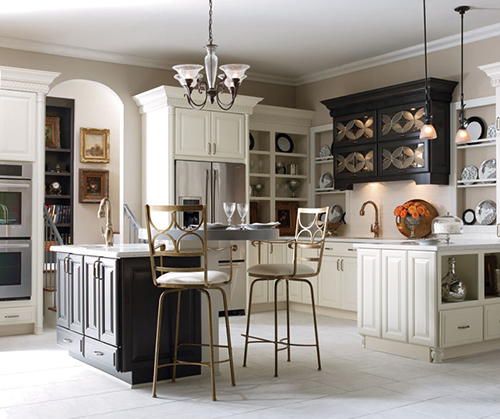 In addition, handcrafted islands that look like furniture with legs will be popular for that unfitted kitchen look. 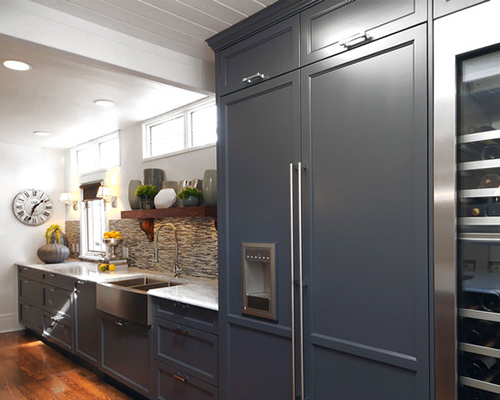 It also adds personality and charm and the kitchen then looks like it has evolved over time. 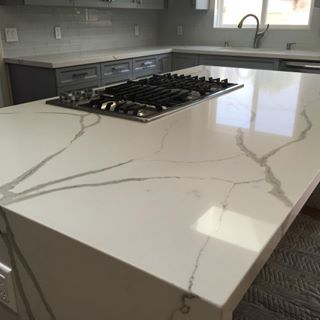 Quartz as a counter will continue to be popular as consumers become aware of its benefits. Quartz has risen steadily throughout 2016. 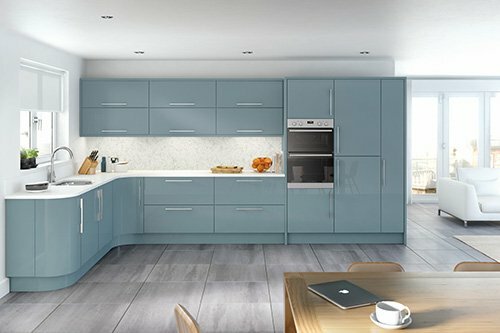 This trend looks set to continue in the year ahead as the quality and value of materials becomes an important consideration. 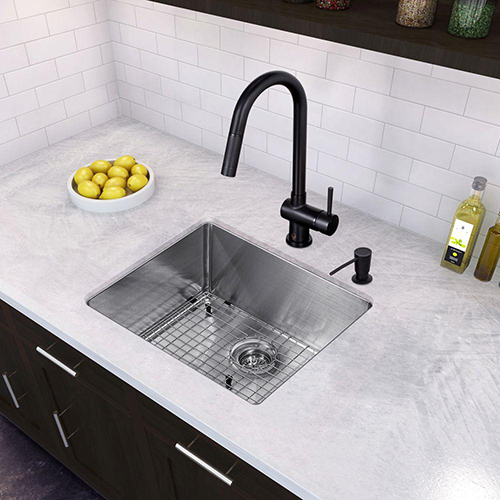 Previously quartz was seen as a luxury kitchen surface, perhaps out of the price range of the average household, but the development of composite surfaces is opening the possibility of natural stone as an option for both kitchen and bathroom surfaces. The upgrade from laminate to natural stone can greatly increase the grandeur of the room for a relatively modest price increase. This luxurious material is prized for its timeless good looks and beautiful variations, whether it’s on backsplashes or countertops. 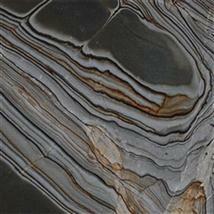 If it’s not in your budget, or the upkeep is daunting, there are plenty of marble lookalikes infiltrating the market.